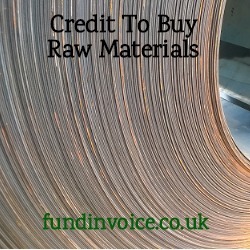 Persuading suppliers to provide you with a sufficiently large enough trade credit to allow you to source all the raw materials that you need can be difficult. We have come across situations where manufacturers end up having to phone around suppliers in order to purchase the supplies that they need. This is why many manufacturing companies turn to invoice funding as a solution. If you are unable to get enough credit to purchase sufficient raw materials it goes without saying that production can be affected, impacting revenue. We frequently assist customers that have received, and need funding against a large one-off order, that will test their current working capital resources. In such instances, they sometimes need to purchase additional material and supplies in order to deliver on a large order. This can lead to a manufacturer knocking up against the credit limits on their trade credit accounts. Many suppliers will operated stop processes, whereby they place customers "on stop" until they settle all or part of their credit account. If you are unable to get the trade credit you need, there are alternative sources of credit available. A business loan could be an option, however the term of a loan may go beyond the time for which you are likely to need the additional credit. You may not wish to be repaying a loan over months or years, to cover a temporary blip in you working capital requirements. Two other options are trade finance and invoice funding. With trade finance you receive a period of credit between making payment to your suppliers, and having to repay the credit. In some cases these types of facilities can be repaid via invoice funding facilities that extend the period of credit even further i.e. using funding against your sales invoices to repay your trade finance. Invoice funding may also be a standalone option. You do not have to become tied into an ongoing arrangement with a funding company. You can opt for a selective facility whereby you submit one or more invoices, for advance funding (called a prepayment). That additional cash could get you over the working capital spike caused by a large order. Many of these facilities are very flexible, such that you could dip into the funding again, at a later date, if you needed it again. In this way, you could use your outstanding sales to finance your temporary requirement for trade credit. The funding could be used to make a cash purchase, or to pay down existing trade credit accounts. Who Can Use Invoice Finance?